The holiday season is in full swing and if you’re like the countless others trying to pull together a last minute festive fete and manage to cross everyone off your shopping list at the same time, don’t fret! Chef James Briscione shares his expert advice on how to plan and host your holiday party and get through your gift list with time to spare. Refreshments: It’s always a good idea to have a selection of Deutsch Family Wine & Spirits wines in the house during the holiday season so you’re always ready to entertain last minute. For red wine, try HobNob Pinot Noir – a delicious fruit forward selection available for around $10. For a good white wine to have on hand, try Skyfall Chardonnay from Washington State – crisp, balanced and available for under $15. 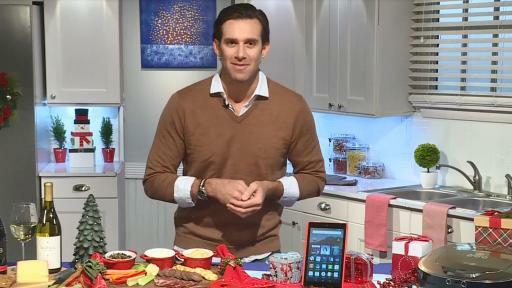 Holiday Timesavers: When we think of time savers in the kitchen we usually don’t think of technology, but there are cool new wi-fi-enabled smart appliances to help you stay organized and make life simpler in the kitchen and around the house. The LG SmartThinQ™ appliances help you easily manage your household tasks from an easy-to-use app, or using voice controls with Google Home or Amazon Alexa. With your smart appliances, you can preheat your oven while you’re stuck in traffic to make dinner prep faster, tell your refrigerator to make more ice, start your robotic vacuum before guests arrive, and even remind you that you left your laundry in the washer so you don’t have to do it all over again. Gift Ideas: Still have a few names to cross off your shopping list? Tablets are a hot ticket item this year and Mom, Dad, Grandma, Grandpa and Junior will all be excited to unwrap one. The Fire HD 8 is perfect for long road trips and plane rides this holiday season. The next generation of Amazon’s highest customer-rated tablet offers a stunning 8” HD display with over 1 million pixels, 16 GB of storage, and up to 12 hours of battery life, plus Alexa…all for $79.99.